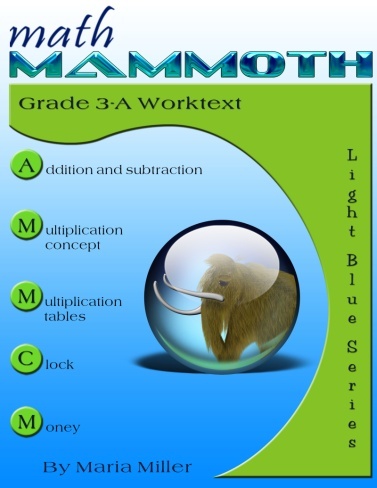 Math Mammoth Grade 3 Complete curriculum - description, samples, and purchase info. Math Mammoth Grade 3 Complete Curriculum is a complete math program for 3rd grade, providing you with everything you need to teach 3rd grade math. It is available both as a download version and as printed copies. You can purchase Math Mammoth Grade 3 as a download, on a CD, or as already printed books. 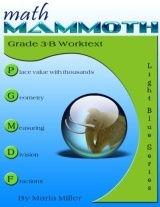 You can purchase a lesson plan for Math Mammoth Grade 3 to use it in Homeschool Planet online planner. Learn more. It requires very little teacher preparation, which is a big help to most parents. The chapter on coins (chapter 5) is included in seven currencies: US, Canadian, British, European, Australian, New Zealand, and South African money. You will automatically get all these versions when you buy the Grade 1 Complete Curriculum as a digital version (download or CD). 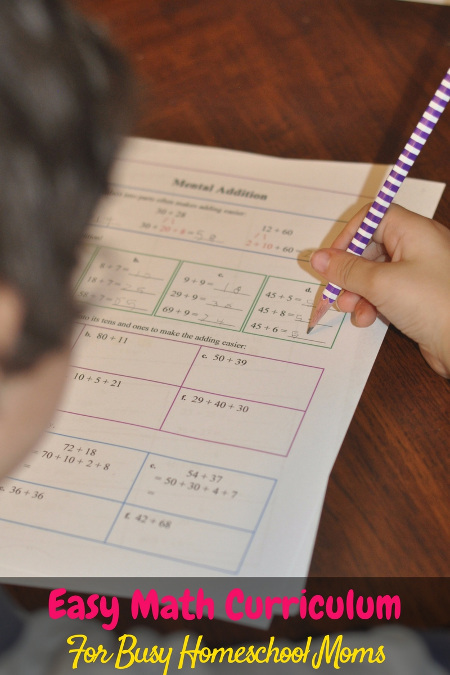 "...Weston has been working through the first worktext in the third-grade level, and he has learned multiple strategies for solving addition and subtraction problems. And believe it or not... he has actually enjoyed learning and practicing new mental math strategies. In fact, I’ve had to learn NOT to offer hints or tips when he is working, because he wants to solve each problem on his own without assistance. (Pretty cool!)" Please also see the table of contents 3-A and 3-B (in the sample files), which will let you see the topics covered in more detail. Here is a list of manipulatives that are needed or recommended for grade 3. Measuring tapes, scales, and measuring cups are only used in the measuring chapter. An old-fashioned alarm clock or other analog clock where you can turn the minute hand and the hour hand will turn as it is supposed to (optional; for 3-A). A kitchen scale that measures in ounces (for 3-B). 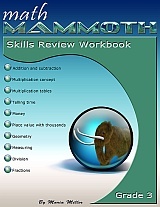 Math Mammoth Skills Review Workbook, Grade 3 provides additional practice for the topics in Math Mammoth Grade 3 curriculum. I recommend you only purchase it once you are sure the student does need supplemental practice. Learn more. Math Mammoth is working out great for my kids, and me. It isn't as complicated to teach/prep as some other curricula we've tried (Singapore and Saxon), but I really feel it covers everything really well. Kids don't mind doing the worksheets... they mix it up so it doesn't get too boring and tedious. We did the 3rd grade program this year for my at level daughter and 1st grade advanced son. I don't make him do quite as many problems (my 3rd grader does them all) since he has the ability, but not really the patience to do as many. We plan on using the 4th grade program next school year. Buying it through the co-op is an amazing value for such a great program. ...it is the perfect blend of easy and challenging for Mr. C.
It's easy to understand but the lessons still give him a real challenge. In one lesson Mr. C was working on mental addition of 2 and 3 digit numbers and he loved challenging himself to get the answers quicker and quicker. While some curriculums might simply say "do the problem in your head", Math Mammoth broke the lesson down step by step to give Mr. C different tips and tricks to solve mental addition in easier ways. Read the full review at This Outnumbered Mama blog. I spent quite a bit of time researching which Math curriculum to use when I started homeschooling my 3rd and 5th grade kids. This was exactly what I hoped to find when I went looking. The placement test helped confirm which level to use. The material is easy to understand, yet challenging. We all love it and will continue to use it! Thank you for creating Mammoth Math! It is beautifully and incrementally organized to promote student learning, makes the kids think, has excellent problem solving throughout, and follows the Common Core better than most curricula. All this for a superb price, especially since teachers pay for much of what is provided in their classrooms! I am no stranger to you now in email...lol. But I just wanted to tell you how much I love your math cirriculum. I love the natural progression within the topic, the reviews and the cumulative reviews. I love the word problems that make them think and the puzzles too. My boys enjoy working in math and understand that some frustration and mistakes are all part of learning. I appreciate the simple rigor in this program. In the end, their longterm recall memory is great because of the progression and spiraling back with reviews and cumulative tests. It is just right for us. Good sampling of problems for the kids to solve without being overwhelming. Instructions are easy to follow. My third grader can read the instructions by herself and work most of the problems with little help from me. We really like the program and for the first time in years both my children (1st & 3rd) beg to continue their math lessons. The only change I would like to see is a little more detail on the instructions and addition of new material. I wanted to say that we love Math Mammoth. This is our 3rd year (3rd grade) and our daughter always enjoys math. It amazes me that she learns the new concepts so easily by just following the workbooks. We don't supplement with anything other than reinforcing the lessons through real life situations. I have enjoyed teaching my daughter from Math Mammoth this year. I can see considerable progress in her math comprehension and her confidence. Thank you very much for sharing with us your math style and offering it at such a great price! I just wanted to say thank you for taking the time to create such a thorough, yet affordable, math program. My husband and I have engineering degrees and our children have logical minds so we feel pretty strong in teaching math. Well, we started off and hung in with Saxon because it reminded us of how we learned math. Our oldest son became confused and our middle daughter "got it" but absolutely hated it, when previously she was doing math workbooks for fun. I tried your free worksheets for lack of something better to do and could see how you give them a small chunk of new material per day, then build on it until they master it. This works perfectly with my son's learning style, and my daughter mentioned, "I like how this lady starts off easy then makes it harder. Her word problems are interesting." I tell anyone who asks how much I like the program. It is rigorous, not dumbed down, but not overwhelming, and a good value for the money. I hope you are seeing increased business and keep up the great work! Also, the You Tube videos are cool. It would be great to have one for all of your chapters. I started using Math Mammoth with my daughter with whom I had been using Singapore. I got frustrated trying to coordinate the HIG with the text and the workbook and the textbook didn't have enough explanation for her. She is doing very well filling in some gaps with Math Mammoth now and is now starting to understand some concepts that weren't clear to her before. I'm impressed with how well it is working especially since we've only been using it a couple of weeks. Hello! I wanted to let you know that I ordered the Light Blue Series 3rd Grade and we've only used it about 4 days but my daughter is really starting to "get" math. She was using BJU and I absolutely love all of BJU's materials, however, the spiral approach to learning math just wasn't working with my oldest daughter. There wasn't enough repetition and the material seemed to only touch on the topics briefly before moving on. I was a bit behind on grading papers this semester and I noticed as I started grading tests and papers that she was really making some horrible mistakes in addition and subtraction. I looked at her and said "tell me what 5 + 3 is" and she held up her fingers counting them one by one and had to think about it a long time. I was mortified! Especially since my husband and I are both skilled in math more than just about any other subject. We started going through the lessons, and both of us cried many tears the first few days, but when she picked up on the "mental math" it all started to make sense to her. It was as if a light bulb came on! She has done well with math up until this point and so it really surprised me that she just wasn't getting it. I'm really excited about using your curriculum and hopefully she'll gain a much deeper understanding of math rather than having to use her fingers to add and subtract all the time. I'm glad I found you on the internet! My daughter was in Saxon math but she was having difficulty learning new concepts and the teacher's book was just too much to sift through and I found it really didn't help much anyways. I switched to the Lightblue series grade 3 about a month ago and use it as our only math curriculum. We really love it. I loved the helps on memorizing the multiplication table and within a couple of days my daughter had her 2's down. It is so nice to have the text with the workbook... my daughter really understands each concept as she does her problems. What used to take at least an hour to complete, she now does in 20 minutes. She recently completed her chapter 2 test and only missed one problem... but when I had her look at it again she realized what she did wrong... now that's what I call total comprehension! Thank you for created this series. I'm definitely going to order the grade 4 curriculum. I wouldn't change a thing. Honestly. In my family we've done Lifepac, BJU, and Saxon and this is by far the best I've found.